Once upon a time I wrote out these glorious monthly updates on my kids during the first twelve months of their tiny little lives. Not only was I prompt with these updates but I was witty, too. I would stick those little monthly stickers on their onesies, set them up for a photo session in the nursery and start snapping away. I didn't even have to refer to the Notes section on my iPhone when it came time to write up their posts because each of their milestones was fresh in my memory. I started off strong when it came to Collins, our last little baby. In fact, I made it a whole two months before I completely fell off the organized, monthly updates wagon. 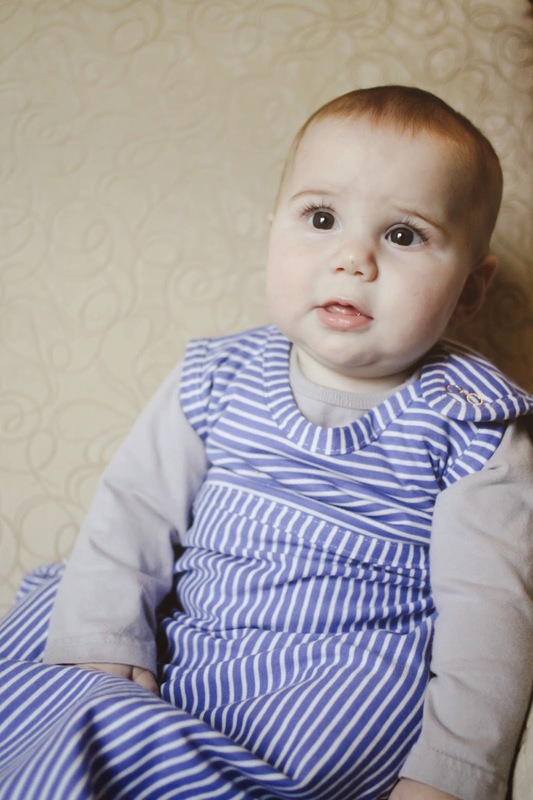 Suddenly he turned six months old last week which seems awfully silly considering I just had him like, yesterday. But he turned six months old and that's when I realized the last update I shared about him on my blog was four months ago. Now, of course, like any mother would, I've still been recording his milestones. Unfortunately some of them are scribbled on the backs of envelopes, others in the Notes section of my phone and a couple of them were even written down on our chalk wall in the playroom. But the truth is I've used this blog as a kind of memory keeper for my boys and I'd hate for Collins to get the shaft. I've loved looking back on what each of the boys was doing at a specific age (Carter, 6 Months and Maclane, 6 Months) and I know I'll love being able to do the same for Collins down the line. 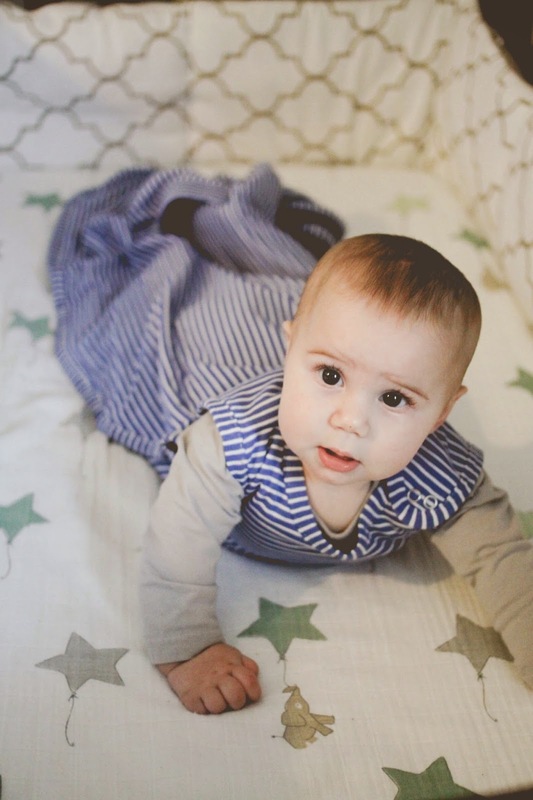 So today, just as he was waking up from his first nap of the day, I snuck into the nursery camera in hand and snapped a few pictures of Mr. Six Months Old. Collins Mason, you are six months old this month! You weigh 21lbs. 12 ounces and you're 27 inches tall! This makes you the exact same size as your older brother Maclane at this age. Friends and family are quick to say that you're starting to thin out but I think that's just because we've hidden all those delicious rolls beneath shirts and pants. Thankfully we've been blessed with a few unseasonably warm days lately which means those chubby thighs come back out to play! You're wearing 6-12 month and 12 month clothing and size 4 diapers. Your hair is looking awfully dirty blonde lately and I think it's safe to say you have big brown eyes like me and your brother Mackie. Each day you prove to us you are your own little person with traits that are a perfect blend of each one of us in your family. It's pretty neat how that works! You're rolling all over the place (back to belly, belly to back), tripod sitting, blowing raspberries and "talking" all day long. You love making noise and it seems like you really found your voice this month and aren't afraid to use it! You're still nursing every 4-5 hours throughout the day. Around five months you were showing quite the interest in our food and so I thought we'd give purees a whirl (something we skipped right over with Maclane) . If there's one thing you can't stand, it's being fed with a spoon. It wasn't until this month that I wised up and started giving you food in the Kidsme Silicone Feeder and you instantly became obsessed with it. So much so that when I try to take it from you to refill it, you pitch the biggest fit. Patience, when it comes to eating, has never really been your strong suit! So far you've nommed on apples, kiwi, banana, pears and sweet potato. You started sleeping in your crib much earlier than your brothers- around the four month mark. You love your crib which makes me love you even more, if that's at all possible. We're on a good schedule, you and I and although I know it can change on a dime, it makes our days run pretty smoothly. You take two naps, one at 10am and the other at 2pm and you go down for the night at 8pm. I dream feed you around 11pm, before I get into bed and you'll sleep on through until 4am when it's time to nurse again. You fall right back to sleep until you're up for the day around 7:30am. Once I slip you into your Merino Kids Baby Sleep Sack and turn on your Dohm white noise machine , you know what's a' comin and you get all kinds of excited. You are a dream baby, indeed. 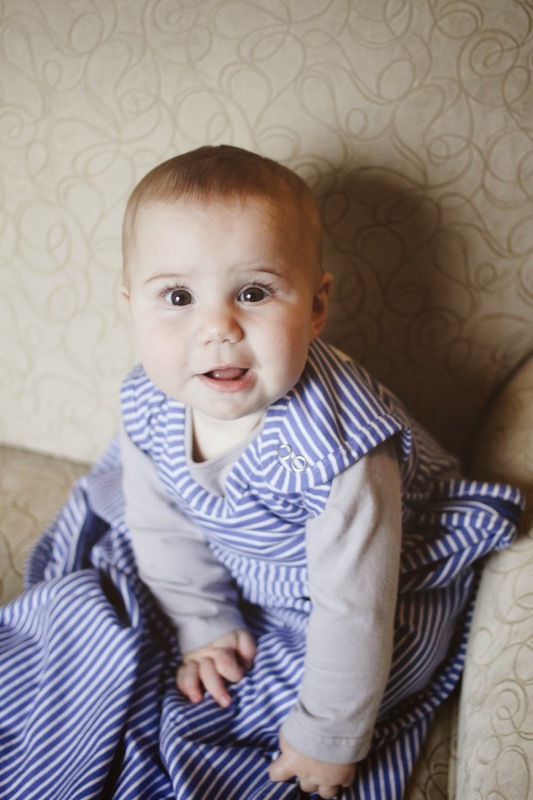 The Merino Kids Baby Sleep Sack is definitely one of our favorite sleep sacks for a myriad of reasons. 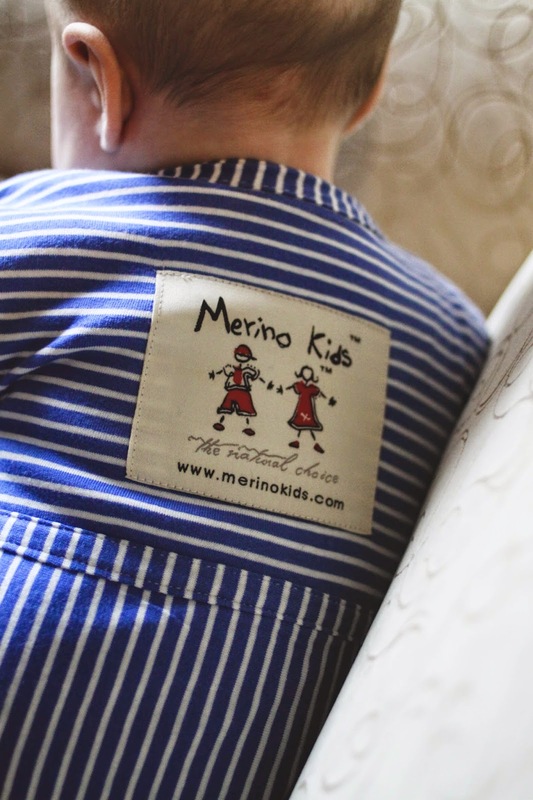 Not only is the superfine Merino fabric soft and comfortable but it's durable, too! It's of a much heavier weight than others we've tried but not so heavy that you wouldn't want your baby wearing it to sleep. Collins is such a hot-natured baby that I constantly struggle with dressing him for bed, playing with the AC/heat in our house and trying to get the temperature in his room just right. 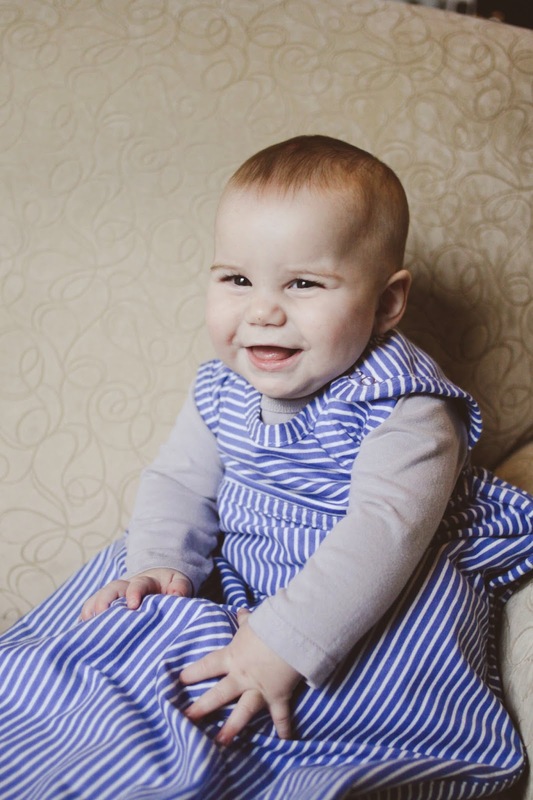 With the Merino Kids Baby Sleep Sack I simply dress him in a long sleeve onesie beneath the sleep sack and he's perfectly comfortable. I love the hidden zipper and how the sleep sack opens completely flat for easy dressing. It unzips from the bottom for easy diaper changes (the kind that don't wake sleeping babies!) and even has the ability to be buckled into a car seat or stroller. Speaking of strollers, you love going for walks outside in the stroller. The minute we buckle you in you start kicking your legs like a wild man! You also love grabbing faces, pinching skin, your brothers, bath time, your activity jumper, Alphabet Activity Cube , Comotomo teether, Num Num Dips spoons , Franky the Hanky Whale , and your 4Moms mamaRoo . I worry so much about your love for the mamaRoo- our days in that bad boy are numbered but it's been one of your favorite things since you were born! It's also been a favorite of mine and I'll be one sad panda the day we have to pack it away. There isn't much you don't love these days, Collins. If I had to pick something, it would definitely be being fed from a spoon! Other than that, you're truly the happiest baby in the entire world. People remark all the time how they can't believe "what a good baby you are!" And it's true. In ever sense of the word. You're a wonderful, easy baby. You've always been the best tiny traveler. You love going places! Whether we're riding in the car to New Jersey, Pennsylvania, Delaware or DC, you're happy as a clam as long you have a dry diaper, a toy to teethe on and a blanket to snuggle close to your face. We're getting ready to celebrate your very first Halloween and you'll undoubtedly be the cutest darn Dalmation dog on the entire block. It's been a whirlwind six months since you joined our family, Collins and without a single doubt I can say you've always been the missing piece to this crazy puzzle of ours. Our family is complete and whole with you in it and you've blessed us with more love and laughter these last six months than we could have ever imagined. Even though I'm sad to see these months fly by, I cannot wait to see what amazing adventures the next six months hold. We love you more than carrots, Collins! Love, Your crazy, loud, sometimes way too touchy-feely-lovey-dovey family. 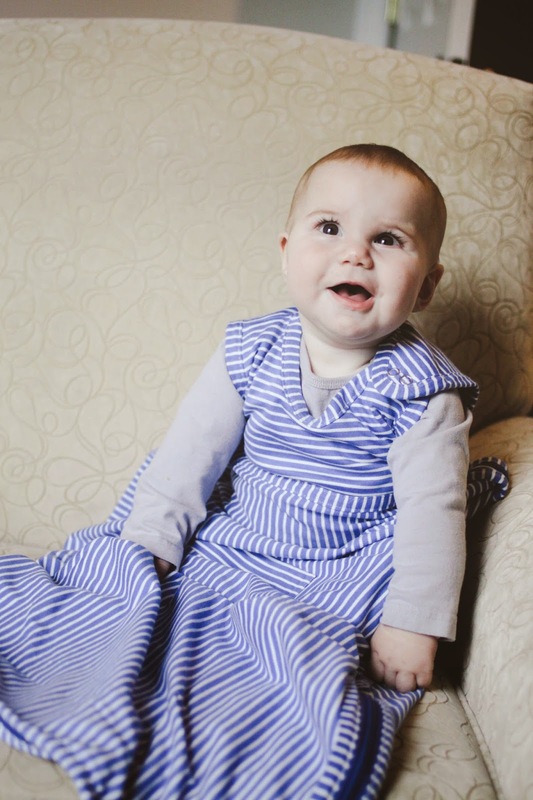 I was provided a Merino Kids Baby Sleep Sack for free to review. All thoughts expressed above are honest and my own. I did not receive financial compensation for those thoughts. I just can not believe that it has really already been 6 months! He is so cute though! Yeah.....My little man just got his ELEVENTH tooth and I think 5-6 are recorded in his baby book :( Second baby syndrome. I was SO ON IT the first time. Halloween PJ Party Link Up!